&bull; The first thing that you would need to do with any liquid spill is to try and clear up the area immediately. Get rid of the excess liquid, in this case the iodine, by using a sponge and absorbing the liquid out of the carpet. Be careful not to rub the spill as this will only make it spread further on the carpet. &bull; Next, get a water-dampened cloth and dab the stain directly. Make sure that you use short and light strokes starting from the center of the stain moving outward. This step will help in removing more of the iodine stain from the carpet. &bull; For the next step, you will need to use sodium thiosulfate, a powder which you can easily buy in many stores. Get one teaspoon of the sodium thiosulfate and dissolve it in a half-cup of warm water. Stir the solution repeatedly until the former is completely dissolved. One warning though when performing this step is to wear goggles and gloves to protect yourself from being exposed to the sodium thiosulfate which could cause skin and eye irritation. 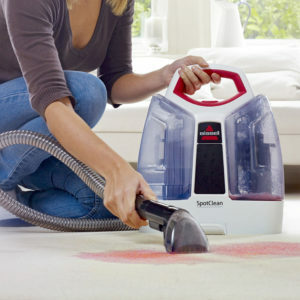 &bull; Try out the cleaning solution you have just made on an unnoticeable part of the carpet to see if it is safe. If it does not damage your carpet then go ahead and apply it onto the stained portion. Then, get a clean white cloth and blot the iodine stain repeatedly until the stain is entirely gone. &bull; For the last step, rinse the place where the iodine stain used to be with a cup of water. Then, dry it using a wet/dry vac to finish off the task.